Prime minister Voreqe Bainimarama has promised Fiji a new flag on October 10, the 45th anniversary of Independence. The new national symbol will be stripped of its British colonial relics; a new chapter will be added to Fiji’s rich flag history. Whether or not Fiji used flags in 1643, when the Dutch explorer Abel Tasman visited the islands, is a matter of speculation. Most likely not; flags as we know them nowadays are a European invention. Originally, flags were only flown in ships to identify where they came from. Fijian canoes will have flown coloured streamers, sometimes with sacred meanings. The first modern Fijian flags were sighted by the American Charles Wilkes, who made an exploratory expedition in the Pacific in the 1840’s. At that time Fiji consisted of a large number of petty chieftaincies, all independent of one another. During his visit to Viti Levu Wilkes observed flags being used by the rulers of Rewa. In 1865 a start was made on the creation of a unified Fiji. Eight chiefs, calling themselves the Assembled Chiefs of Fiji, who met on May 8 and 9 in Ovalu agreed to form a Confederacy. The Chiefs present were Vunivalu of Bau, Roko Tui Dreketi of Rewa, Tui Cakau (Golea) of Cakaudrove, Tui Bua of Bua, Ritova of Macuata, Bonaveidogo of Naduri, Macuata. The Tui Nayau of Lakeba had sent a representative. Among other matters the Assembled Chiefs agreed on adopting a national flag; the first flag representing a united Fiji. The Sydney Mail of August 12, 1865 mentioned that the flag adopted was a white star of eight points on a dark blue ground. Although no symbolism of the flag was given, it is logical that the blue symbolised the Pacific, while the star stood for unity, the eight points representing the eight united Chieftaincies. The first president of the Fiji Confederation was Cakobau, Vunivalu of Bau. The presidency of the Confederacy was to rotate annually. Two years after its creation Ma’afu, the ruler of Lakeba, was due to become the next president. Because he was Tongan and therefore owed his allegiance to the King of Tonga, the Western Chiefs left the Confederacy in protest, leading to its collapse. Cakobau immediately set up a Confederacy of the Viti Levu Chiefs, called the Kingdom of Bau. He was crowned king on May 2, 1867. At the coronation ceremony the flag of the new kingdom was displayed. According to the Sydney Morning Herald of July 30, 1867, which described the ceremony, “the Bau national flag, the colours of which are white, blue, and red, placed horizontally, with the sun rising out of the blue ground, and a crown in the top corner” was seen on that occasion. The Constitution of the Kingdom of Bau said in Article 35: “The King’s standard and national ensign are maintained as now established.” Later, a special flag law on the use of the flag was written. The separation between the two Fiji’s lasted only a few years. Cakobau proclaimed a united Kingdom of Fiji on June 5, 1871. Six weeks later Ma’afu acceded to the kingdom. Right from the start this kingdom used a flag featuring blue and white vertical stripes and a red shield depicting a flying white dove in the centre holding a green olive branch in its beak. The dove, being a symbol of peace, was derived from the light blue flags of Methodist missionaries who had visited this part of the Pacific since 1835. These flags didn’t exist very long. The Executive Council of the King made a resolution to replace them by a red flag divided in into four equal cantons by a blue cross with a white border and a crown in the centre. The merchant flag was the same, but without the crown. The King’s personal flag however remained the same. The united Fiji Kingdom was governed badly. It overspent causing economic and social unrest. In an effort to stop further chaos, Cakobau offered his Kingdom to the British government in 1872. He had already done so a decade and a half before. Then the British weren’t interested; the second time the request was granted. The Union Jack served three years as Fiji’s sole flag. In 1877 a start was made to introduce a distinctive flag for the colony. However, it had to follow British rule. Fiji could have red and blue ensigns to be used in local ships; a red ensign for private vessels and a blue one for government owned boats. Both ensigns had a miniature version of the Union Jack in the top left corner, and a local badge of the colony in the centre of the flag’s fly end. The badge distinguished it from similar flags used in other British colonies. A third version of Fiji’s badge came in use after July 4, 1908, when in London a Royal Warrant was issued for Fiji’s own coat of arms. It reflected Fiji’s ties with the United Kingdom and is still in use. The shield of the coat of arms shows the Cross of St. George, England’s patron saint. In the top of the arm’s shield is an English lion, holding in its fore paws it holds a cocoa pod, a Fijian produce. Three of the four quarters around the cross in the shield also contain local crops: sugarcanes, a coconut palm and a bunch of bananas. The remaining quarter shows a dove of peace as a reminder of King Cakobau. The supporters are two Fijian warriors dressed in mulberry bark tapa skirts, one of them holding a lance and the other a pineapple mace. The crest features a wreath Argent and Gules as well as a canoe with outrigger. The motto displays the national motto “Rerevaka na kalou ka doka na Tui” (Fear God and honour the King). When in the beginning of 1970 it became clear that Fiji would become independent that year, it was decided by the Government that a new national flag was needed. On May 29 a nationwide competition was announced for a design. Three cabinet members judged the entries. At the closure of the competition 410 entries had been received. Blue was very much the favourite colour, and the Union Jack was included in no more than 172 of the designs. Also a large number favoured the arms. As they came up with very similar designs, the competition was jointly won by Mr Robi Wilcock and Mrs Murray MacKenzie. The winning design was modelled after the Blue Ensigns used in Fiji’s colonial past. The dark blue used in the colonial era was substituted for light blue, to symbolise the Pacific Ocean. It also distinguished the Fiji flag from the flags of nearby Australia and New Zealand. Ensigns for use in Government vessels, in merchant ships and in naval vessels were of the same basic design, but have dark blue, red and white backgrounds respectively. The Cabinet adopted the committee’s recommendation, and this was communicated by the Governor on June 30, 1970 to the Secretary of State in London. Queen Elizabeth approved the design, after which it was registered at the College of Arms on September 30. At the Independence ceremony on October 10, 1970 in Suva, the British Union Jack was substituted by the new Fiji flag. 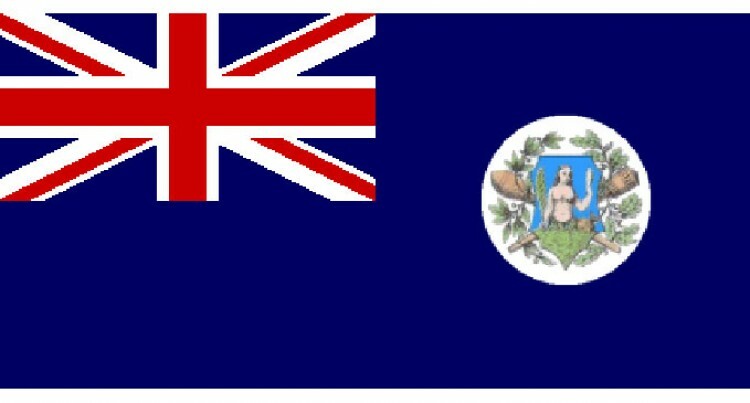 Ever since Fiji’s flag of Independence was introduced it has caused controversy, especially the Union Jack and the coat of arms, as they both symbolise the colonial past. After the two coups in 1987, when Fiji became a republic and the links with the United Kingdom were broken, a National Flag and Anthem Committee was formed. It came up with five new flag designs and made a recommendation to the Cabinet: but in the end the whole idea of changing the flag was shelved. The Great Council of Chiefs suggested in 2005 that the flag of the country should be altered. They wanted to see the two Fijian warriors from the national coat of arms on the flag, as well a miniature canoe. No such change was made, but ever since the quest for a truly Fijian flag, freed of its colonial symbols, has increased. Now Bainimarama has called for a flag competition. The winning design will be unveiled on October 10, 2015. This time there no permission is needed from Queen Elizabeth. Parliament will have the last word.